Whenever Cindy Mindell stops by the transfer station, she hopes Bart “Bud” Valiante is there. The array of trash choices — recyclables, household, electronics, metals, bulbs and batteries, etc. — is dizzying. But, Cindy, says, “Bud is always cheerful, professional and helpful. He offers to carry stuff from my car, walks me to the correct disposal area, and explains why a particular material or item is or is not recyclable. That’s not all. The other day, Cindy told Bud that she was sleep-deprived and panicking because she was in the middle of a move. He offered to haul items to Goodwill and the transfer station at no cost. He said he’s always happy to help a neighbor in need — and regularly does things like that before and after work. Cindy did not take Bud up on his kind offer. But, she says, “No matter how busy he might be when I arrive, he always stops to answer my questions and make sure that I put everything in its proper place. 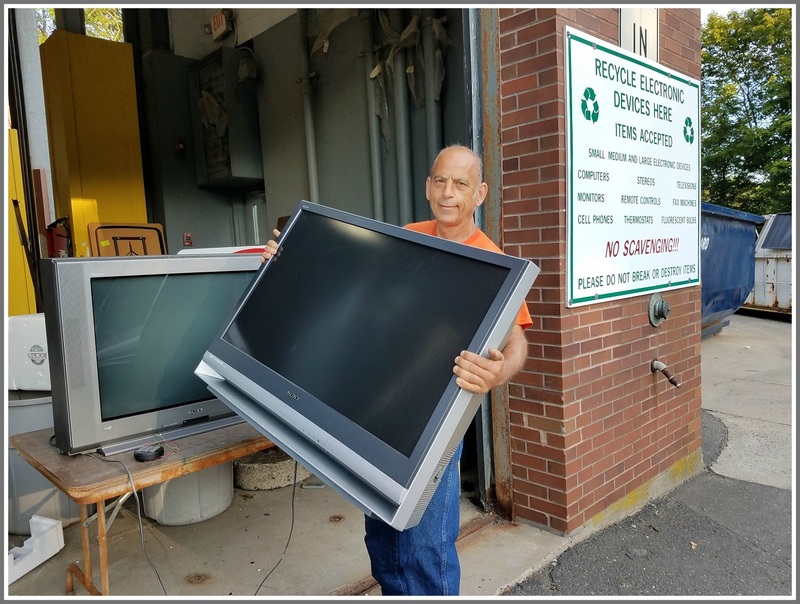 This entry was posted in Environment, Unsung Heroes and tagged Cindy Mindell, Mark Valiante, Westport transfer station. Bookmark the permalink. The guys that grew up in town are always the best to know. Thanks, Cindy. There are plenty of us in town who agree with everything you said about Buddy. This post makes me soooo happy. Thank you, Buddy, for all that you do! Bud is just a great guy to know. Everything said in the article is absolutely true. I know from experience! Thanks to my friend, Bud V.
I agree – Bud is always helpful and does a great job at the Transfer Station. Buddy always has been a great help to me whenever I go to the transfer station. I see how much he goes out of his way to be very helpful to all others! Buddy is the best. Always willing to help. He has a great Dad too !!!!!! I will have to find out Buddy’s schedule and make sure that I go to the transfer station when he is working. In ten years of living in Westport no one has ever offered the slightest help to me. I was there on Monday and after putting my recycles in the dumpsters I had one very large bag of trash for the big trash receptacle. I should have gotten a grocery cart, but I muscled it there on my own with a struggle and one of the employees walked right by me without a glance. I have assumed it was not their job to help because they never do. A few months ago on a rainy day another car badly hit mine while it was properly parked at the station. I was yelling frantically and was amazed that no employees, or other people who were there, came to see what was going on. On many days I find that the movable steps to the recycle dumpsters have not been moved to the open windows. With serious shoulder problems I find it physically impossible to lift up the bags of glass and metal recyclables and properly empty them into the dumpsters, so I just shove the whole bag in, including the plastic bag which is forbidden. Once long ago I did mention to a worker that the stairs were not where they needed to be and he did move them. Often I do not see any employees there. I’m glad (and envious) to hear that other residents are receiving such courteous and thoughtful help. I still bring my garbage and recyclables to the transfer station, so I’ve gotten to know Bud. He’s there to do the heavy lifting, which I need more than I used to, and he does it cheerfully. When we hear criticisms of government, remember that it’s people like Bud who do the work that makes the wheels go ’round. Super nice guy. Good choice. Bud has always been a great source of help to me when working on our house. He gives advice on projects and is a welcoming face at the transfer station. What an asset! While Bud seems to be very helpful, I am with Molly what is his schedule because I go to the dump at least once a week and have been doing such since 1982. I am a senior citizen and absolutely no one has ever offered to assist me with by bags of garbage. In fact, once I lock myself out of my car and I asked a man who worked there if he would help be call my cousin , his reply was he couldn’t help and I should be more careful. While Bud is being praised why don’t any of the other workers help folks instead of avoiding them. needing an extra hand, a remarkable character. I agree! Buddy is the best. and friendly which I deeply appreciate. I agree with all the wonderful comments..
We should nominate him for most hard working. Some people say that more Westporters know Bud Valiante than their local politicians. He greets everyone who comes to the transfer station and remembers each person by their name. Rain, sleet, snow, or sunshine, he is out there helping fellow citizens. He is eager to assist in carrying heavy objects and answering questions. He takes pride in his work and keeps the place clean. Over time he has developed relationships with those who are regulars and takes an interest in their well-being. Bud actually cares about the citizens of Westport. He is not just a town employee but a long-time resident. He is one of us. He makes doing a chore pleasurable. To us, he is the primary liaison of the Public Works Department, and a good one at that! A great guy from a great family. An excellent choice! I have always found everyone at the transfer station as helpful as you want them to be. It should be noted that some, as is Bart, are town employees and others work for the refuse removal company. Excellent Story & Choice on an 06880 Home Grown – Major Dude! Keep lookin’ on the Bright Side…! So funny to read this story and the comments about Bud. He is all that is written about him above. He has helped me many times, and is always there with a ready greeting. I told him the other day he is a great ambassador for the town and here is the proof.